During the 1920s, Frances B. Schneider did a lot of field work on birds all around the southern California. Her records on Mountain Plover in the San Fernando Valley have been valuabe during my research into that rare bird. Now my historical research has discovered that she made many valuable field observations of birds in Ballona, Playa del Rey, Bolsa Chica, Inglewood, and elsewhere on the Los Angeles plain. Frances Schneider submitted her observations on birds to Joseph Grinnell and Harry Swarth at the Museum of Vertebrate Zoology at the University of California in Berkeley. As editors of the CONDOR, Grinnell and Swarth reviewed her articles before publishing them in the premier ornithology journal called CONDOR. Mrs. Schneider published several articles in CONDOR during the 1920s-1930s. In addition, she compiled the quarterly reports on bird observations for Audbon's BIRD LORE. As a compiler, she had responsibility for assembling the Los Angeles region field reports for Audubon's BIRD LORE. Keep in mind that until the 1940s, the Audubon Magazine was called BIRD LORE. As for Terns, it appears that Frances Schneider had a significant interest in shore birds and sea birds, from Plovers & Sandpipers, to Terns & Gulls. In addition, it is quite evident that she loved the ocean and coast of California. As for history of birdwatching, her glimpses of an earlier era are to be noted for the names of fellow birders with whom she associated. It is of interest to note that 75 years ago, in 1926, the telephone was already a way to contact fellow birders about rare bird sightings. In the article, we note that four telephone calls were made between Pasadena and Playa del Rey. Phone calls occurred between Mrs. Schneider and fellow birders (Miss Craig, Mrs. Bates, Mr. Wyman). Lastly, from my experience as a professional geographer, I note that Frances Schneider accurately described and contrasted the difference of lagoons, marsh, canals, tidal flats, and dune [crest] as landscape features of the L.A. plain. Mrs. Schneider was a true original, a genuine "Friend of the Ballona Wetlands," 55 years before the pseudoenvironmentalist-Friends of Ballona Wetlands (real estate developer friends & spies) arrived on the scene. During July and August of the present year, Miss Agnes Craig of Pasadena was staying at her house at Playa del Rey, which affords a full and unobstructed view of the near-by canals and lagoons, and a portion of the beach and ocean. Early in the afternoon of Friday, July 30, she looked over the area with 8-power binoculars, and saw nothing unusual. Some two hours later, observing a great increase in the size of the flock of gulls and Forster Terns congregated on the exposed tide flat in the main lagoon, she went out to the dunes overlooking the assemblage, and found there a very large flock of Elegant Terns (Sterna elegans). She then called Mrs. Josephine Bates, of Pasadena, and myself by telephone, and on the following day we joined her at Playa del Rey, finding the Elegant Terns still there in the hundreds. I then telephoned Mr. L.E. Wyman, in hopes that he would go down and confirm our observations. A week passed, however, before he was able to do so. At the time of their arrival, the color of the bills of most of these Terns was a bright coral red, paling to yellow toward the tips. During the time of their stay the red gradually faded out, leaving the bill yellow, bright in tone. The breasts of a great many of the adults were flushed with delicate rose pink, not observable in all lights. An estimate of the total number of the birds present must be only approximate, as they were often divided into several groups, some of which frequented the adjacent marsh and rested on the flats there, while many came and went between these points and the ocean, where their gleaming white forms beautified the scene day after day. Partial counts were many times made, bearing out the conviction that there was a total of upwards of three hundred birds in the area. A great many were about the Hyperion pier. Bolsa Chica also was visited by small flocks, nine and fifteen being observed there on different dates. The large flock was accompanied by a few young, still being fed. On Friday, August 27, exactly four weeks from the date of their arrival, the majority of the great flock departed as suddenly as they had come; and on the 28th the remainder disappeared, with the exception of two individuals which were seen from time to time about the lagoon and marsh. My last personal record of them was September 17.-FRANCES B. SCHNEIDER, Los Angeles, California, October 10, 1926. In the 1920s era of birding, the report of Frances Schneider to note Elegant Terns in southern California was significant. 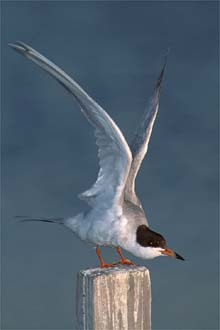 From 1997 to today in 2001, I have noted six kinds of Terns common at Playa del Rey, depending on the season of the year. In spring and fall, four kinds of Tern common (Elegant, Forster's, Caspian, and Royal). Today, just as in 1926, about 300 Elegant Tern gather at Playa del Rey and the Ballona Wetlands. Occasionally a fifth kind of Tern, the Black Skimmber has joined in to roost in small numbers. Of course, just as in the 1920s, the Least Tern still arrives in Venice-Playa del Rey in May to nest each year. We must save more beach for the Least Tern, as artificial islands are not the appropiate for Least Tern. 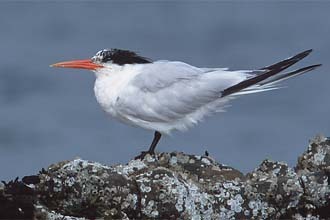 However, artificial islands are used by the other Terns. If Frances Schneider were alive today, to see the land east of Lincoln, being ruined by bulldozers and people called environmentalists (Friends of Ballona Wetlands) with a Tern as their logo, she would be horrified. Here we are in LA in 2001, ruining the chances of all these Terns nesting and roosting and foraging at Ballona in the future. For example, Area C, east of Lincoln and north of Ballona Creek could be a significant place with islands for nesting and roosting Terns. It would be an excellent State Park. County Supervior Deane Dana wanted a courthouse to be on Area C, now called Ballona Northeast. Councilwoman Galanter wanted to put condominiums and businesses on Area C. Neither has happened, thank god!! In 1990, Controller Gray Davis stood up against local politicians. And now, the State Controller, Dr. Kathleen Connell has stood up to the local politicians. The conclusion is that local government whether it is city government or county government, fails us. We will need more federal & state "CONSENT DECREE" decisions to fix urban Los Angeles. If it hadn't been for the State judges on the Mono Lake issue, Galanter and then Mayor Bradley would still be draining beautiful Mono Lake of its precious water. If it hadn't been for federal judges, we wouldn't have a Hyperion Treatment Plant cleaning our sewage before it goes into the Ocean. Again, Galanter and then Mayor Bradley would still be dumping raw sewage into our ocean. You just can't trust City Hall, Los Angeles in particular, to do the right thing. Look at our Police Department and the Belmont School fiasco, as two more LA City blunders by Mayor Riorden and the City Council. If James Hahn becomes Mayor, it will be more of the same. However, if Villaraigosa is Mayor, there may be hope? If you hear Galanter saying that she is the one who saved Mono Lake and got EPA to build the new Hyperion, just laugh at her, and tell her that she is like a "used-car" salesman or like Chevron Oil company and its false advertising. It is an odd quirk of fate for this field biologist/geographer to do field research in an urban area with a bit of wild nature desiring protective status. Deciding to look at the private property signs and the fences as a bit of un-natural history was suggested to me by several people who attend my monthly natural history tours of the Ballona Wetlands, for nearly two years now. I now have been able to lead some tours to Area C. The Area C land was shown to State Parks officials, California Fish and Game, and the National Marine Fisheries Service, last year. Each month now, I take the second part of the tour to an overlook site that gives us a beautiful view of the tidal creek in Area C. The movement of the tides into Area C is discussed. We study the tule reeds, saltbush, and pickleplant. I discuss the Yellowthroat (warbler), Song Sparrow, Green Heron, and various Swallows. On the last tour, I pointed out an interesting Hawk and Falcon interaction that took place over Area C. I discuss the many thousands of fish in the tidal creek, not to mention the countless Pacific Tree Frogs. And lastly, I briefly discuss the un-natural history of the private property signs. I indicate that the signs come in four colors representing four decades and four entities who placed the signs there.The first era is marked by the red-lettered signs placed there in the 1970s by the Howard Hughes Estate. The black-lettered signs were put up MaGuire-Thomas Developers in the 1980s, the green-lettered signs were put up by Playa Vista (1990s greenwashing), and the white-lettered signs on blue background are the newest "millenium-era" signs of 1998-2000. There were 55 private property signs and now there are 60 private property signs. At this rate it would not have been long before there was one private property sign for every acre of public land in Area C. By the way, there are about 70 acres of land in Area C, now known as Ballona Northeast. Finally, the signs have been coming down in April and May 2001, again thanks to State Controller Dr. Kathleen Connell. On the other gloves however, Ruth & Ruth (Galanter & Lansford) are trying to make a bad deal on a piece of land with beautiful nature, called Area C. These two Ruths would have the State of California sell this land to a private entity rather than it be a State Park. It is a ludicrous idea. The citizens of LA need to know about these two Ruths, (babes they are not, as in Babe Ruth). There is no home run here. These two Ruths have struck out! They have no business destroying an important Little League Baseball Field, by building a road, condominiums, and offices through the Field. It is our belief that a baseball field and nature can co-exist in this State Park, but there can be no roads and tall buildings here. The State Controller who has responsibility for this land has told the parents of the Little League that they can remain in Area C. We have here a home run for the Heron & Egret. "For Homeruns and Herons." In spring 2000, the two Ruths convinced the the US Army Corps of Engineers and LA County Public Works Department to build a new fence along Ballona Creek without permission from the State Controller. This fence is so close to the ground that it effectively eliminates wildlife movement of mammals between the Area C wetland/prairie and Ballona Creek. It is not a homerun for wildlife in anyway. It disappointed me as a field biologist and geographer to witness the building of this fence. If the fence were removed the wildlife such as Great Blue Heron and the large white-feathered Great Egret would be able to forage in more acreage for gophers and reptiles and insects. The presence of fences keeps a Heron and Egret about 20 feet or more from the fence. Over the course of a mile along a fence, it can amount to many acres of lost foraging habitat for the Heron and Egret. In essence, less fence, means more habitat for large-white feathered Egret and Great Blue Heron. To our great amazement, the State Controller, Dr. Kathleen Connell, came out on a rainy Saturday in March and then again on a sunny day in April, to cut the fence down and remove a private property sign. Here was a homerun, and the two Ruths had their "untruth" exposed. In May 2001, I have seen the Great Blue Heron on two occasions, feeding close to the area of the former fence for gophers. A new park East of Lincoln Boulevard for Herons and baseball. Hooray for baseball Youth, Gophers, Egret and Herons.